War. What is it good for? Absolutely nothing. Just a few days ago, I shared a few thoughts about how thoughts of love, expressed through action, can overcome even the longest history of hatred. We always have choices in life: These choices determine whether we create hatred or love, war or peace, despair or hope. If we choose to act in ways that create love, peace, and hope, then we will create a loving, peaceful, and hopeful environment, which will foster cooperation, harmony and well-being. Conversely, if we choose to act in ways that create hatred, war, and despair, then we will create an environment of hatred, war and despair, which will lead to tyranny, oppression, death, and wanton destruction. Peace is light, whereas war is darkness. Peace is life; war is death. Peace is guidance; war is error. Peace is the foundation of God; war is a satanic institution. Peace is the illumination of the world of humanity; war is the destroyer of human foundations. When we consider outcomes in the world of existence, we find that peace and fellowship are factors of upbuilding and betterment, whereas war and strife are the causes of destruction and disintegration… Consider the restlessness and agitation of the human world today because of war. Peace is health and construction; war is disease and dissolution. When the banner of truth is raised, peace becomes the cause of the welfare and advancement of the human world. In all cycles and ages war has been a factor of derangement and discomfort, whereas peace and brotherhood have brought security and consideration of human interests. This distinction is especially pronounced in the present world conditions, for warfare in former centuries had not attained the degree of savagery and destructiveness which now characterizes it. If two nations were at war in olden times, ten or twenty thousand would be sacrificed, but in this century the destruction of one hundred thousand lives in a day is quite possible. So perfected has the science of killing become and so efficient the means and instruments of its accomplishment that a whole nation can be obliterated in a short time. Therefore, comparison with the methods and results of ancient warfare is out of the question. Recent human history is stained with the “savagery and destructiveness” that is part and parcel of war. 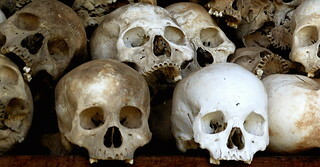 The Killing Fields of the Khmer Rouge. The Armenian genocide. The Rwandan genocide. The Trail of Tears. Srebrenica. Nanking. Auschwitz. Dresden. Verdun. The Somme. Leningrad. Hiroshima and Nagasaki. Korea. Vietnam. Syria. Yemen. The list goes on, and on, and on. On days such as today—Remembrance Day in Canada, Armistice Day elsewhere in the world—people everywhere observe moments of silence to remember the victims of the atrocities of war. And yet, the “satanic institution” of war, the “destroyer of human foundations” continues. Why? Why do we continue to choose war, to choose hatred, to choose despair? Humanity still resists the spiritual transformation to which it is called in this day. As ‘Abdu’l-Bahá says, we have perfected the science of killing and brought it to its zenith. Humanity has reached the consummation of its material powers. Material means can bring us no further in the evolution of our species. What is needed now is spiritual evolution. We must learn how to choose peace, how to choose love, and how to choose hope. It is not enough to remember our fallen soldiers on Remembrance Day, or the victims of war or the many atrocities that war produces. Yes, we must stare down the rows of gravestones and piled-up skulls, and pray for the progress of the souls who have passed onwards in their journey through the spiritual worlds. But we, the living, must resolve to honour their sacrifice by changing the way we live, and by teaching our children the skills and the virtues they need to make peace a permanent reality. To show kindness, compassion, and a burning love that embraces all of humanity. To resolve their conflicts through words rather than blows. To act with trustworthiness and justice, and always deal fairly with their fellows. To know that they, and all their peers, are noble creatures of God deserving of respect. To hold the human spirit, and everything which God has placed on this green earth, as a sacred trust, and to guard that trust for future generations. These virtues are spiritual skills that do not develop without effort: We must acquire them through education and conscious practice. Only when each one of us becomes fully involved in teaching these skills to the rising generations will this world become another world. Ensuring that everyone has the chance to acquire these skills will pull out the roots that feed the curse and scourge of war—allowing it, finally, to be blotted out from the book of humanity. 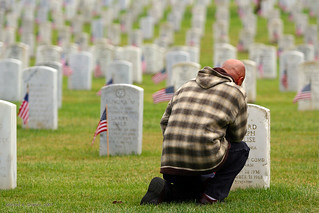 The original post, honour the sacrifice, not the war, is one of the most popular posts on doberman pizza. Photos: Respects by Mitchell Shapiro Photography, and Red Khmer Killing Fields by Ann-Kathrin. 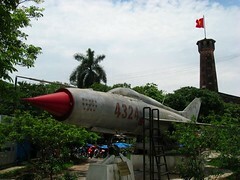 Prior to going to Vietnam in 2009, I really had little idea about the history of the place. I knew my father had made the choice to come to Canada from America in the 1960s to avoid being drafted into the army and sent to fight the war in Vietnam, but I had little knowledge of that conflict itself, its background, or indeed of any of Vietnam’s thousands-of-years-long history. I suppose until the country and its culture became a part of my life through marriage, I was too lazy to learn much about it. Since then I’ve spent a lot of time reading about the history of Vietnam, and even compiling information about the history of the Bahá’ís of Vietnam. The latter has been really fascinating, as I’ve learned just how active the Bahá’í community was in the 1950s and 1960s, and how far it had been able to develop by the end of the war. […T]here was a young American soldier in Vietnam, experiencing his very first time in an actual battle and scared to death. In an attempt to gain some courage, he yelled the Bahá’í greeting [Allah’u’abhá] and was surprised to hear it returned from the other side of a clearing. But after a bit of hesitation, he went in that direction, saw a Viet Cong soldier who again repeated that greeting. They met, hugged each other and each took off in the opposite directions. While I was not there to see it, I can well believe it actually happened, and probably more than once, and the one I heard it from told it with conviction and with tears in his eyes. TheMerryOnion, a Bahá’í blogger formerly from Newfoundland, blogged about a similar story last year in a post about her personal heroes, the first of which was the subject of the story, a Vietnam War veteran named Reggie Baskin. Reggie was the first person I ever interviewed. […] I chose Reggie because I knew he had been to Vietnam as a soldier during the war, and also that he was a Bahá’í and therefore fighting and violence had to have been against his conscience. The interview went well and he told me some fascinating stories that I still remember. One in particular sticks in my mind: he got separated from his group and met up with a group of about twenty Viet Cong soldiers. He figured he was about to be killed, but the CO of that group recognized the symbol on his Bahá’í necklace. This man was also Bahá’í, greeted him with “Allah-u-abhá” (the universal Bahá’í greeting), and took his men on their merry (or not) way. Who says religion always causes conflict? In this case, it saved a man’s life. Look forward to more of these stories in the future as I continue to dig through the history books. There are just too many amazing things to share. hey all you wonderful people. it’s been a long week and an even longer month, filled with lots of busymaking, vacationing, and picture-taking – and even some singing. you’ve probably noticed, but just in case, do pop by my flickr site to check out the latest photos and leave a comment or two. Along with updated vacation photos – mostly landscapes so far, more people shots coming soon – I’ve also posted some photos of the Super Ex, taken on the day I performed at the Joy of Faith concert with a musical group of Baha’i youth (well, mostly youth, with one youthful gentleman along for the ride). It’s that time again. What time, you ask? Why, the time to get children’s classes in gear for the upcoming year. Our local coordinators have been kind enough to forward me copies of a pilot curriculum for Baha’i children’s classes, developed by the National Spiritual Assembly of the Baha’is of Canada, based on the “Baha’i Education for Children” series by A. A. Furutan. I’ll be using the pilot curriculum as a framework for our children’s class (“our” because I’m not the only teacher, and because the class is starting to feel a little like a family to me), which will entail translating it into French and finding corresponding French-language activities to replace those that don’t survive translation. See baha’i children’s class ideas to follow the progress of the class this year. Those of you who have been following the situation in the Middle East and who have wondered about the state and condition of the Baha’i World Centre and Holy Places in Haifa and surroundings will be pleased to know that, according to the most recent communication from the Universal House of Justice, “no damage was done to the Holy Places and that the friends here remained in safety, pursuing their tasks with steadiness of purpose and exemplary perseverance”. Of course, as has been noted by many people since this most recent outbreak of violence began, we must remember to keep in our prayers not only our friends at the World Centre, but also our many fellow human beings who find themselves innocent victims of this conflict. Perhaps now, more than ever, is the time to rededicate ourselves to championing the Cause of world unity and to teach peace all the world around (to borrow a turn of phrase from Red Grammer). Part of my efforts in this wise include my participation in the core activities of the Baha’i Faith, most notably the above-mentioned children’s classes. I’ve also had a strong desire to start a study circle that would allow friends, family and acquaintances to get together and exchange on some of these topics. If you’re in the Ottawa area and you’d like to get involved, please do let me know. On a side note, I’m seriously considering returning to my earlier vegetarian diet, after a hiatus of a few years (induced by a knock on the head). I was originally a pesco-ovo-lacto vegetarian, which means I would eat fish, eggs and dairy products – I’m thinking I may become pesco-pollo-ovo vegetarian, adding chicken but cutting out dairy (since I definitely have lactose intolerance issues). Basically, that would make me semi-vegetarian, or “wishy-washy” as some might put it. Any feedback, comments, and encouragement you may have would be greatly appreciated – via email or comment on this post. And Martin, I already know what you think. In its short lifespan (operating since January 2006), the brilliant baha’i blog Baha’i Views has acted like a window on the Baha’i world, bringing its readers daily glimpses of the global Baha’i community through quoted blog posts written by individual Baha’is, official press releases, and mentions in the mainstream media. The latest post – and perhaps the last for a while? – ends on an optimistic note, quoting christine and brian’s blog as they present an article translated from a local Israeli newspaper that describes life at the Baha’i World Centre in Haifa. Every evening, when the darkness falls, the lights of the Bahá’í Shrine are turned on and it is one of the most spectacular places in Israel. One might think that during the days of war, the Bahá’ís would dim the lights so that it wouldn’t turn the Shrine into a target for the Lebanese rockets, but the opposite is true. The illumination of the Shrine that looks over the Haifa bay and Lebanon are lit every day until midnight. In normal times the Bahá’í Shrine and the terraces are one of the central tourist attractions in Israel. Every month it is visited by about 60 thousand visitors. From the beginning of the war the gardens have been closed. Even the 80 gardeners of the most beautiful well-kept gardens in the country don’t come to work. Now the heads of the community are worried about the health of the plants and beautiful flowers. Maarten Scot from Holland, married and a father to a seven month old, who works in the Statistics Department, came as usual to work. “When the first rocket hit Haifa I was in shock, one wouldn’t expect this and it is even a little worrisome”, he explained, “if ones looks a lot at the media you get the feeling that the city is on fire, but from here, when I look at the city ? it is the same city”. The Bahá’ís believe in world harmony and peace. Even yesterday, in the heat of another day of war, the peace in this place is maintained even though the sirens don’t stop going off. Under one of the most magnificent buildings at the Centre, are below ground bomb shelters that can easily accommodate all the workers. Long tunnels lead to bomb shelters that are clean and well kept…Even with how the bomb shelters look, only some of the workers come to them when the sirens go off. Here’s an AFP story posted on Yahoo News about the reaction of Baha’is in Haifa to the shelling of the city and the current conflict in the area. British couple Gillian and Anthony Henderson have come on pilgrimage from their home in Vancouver, Canada. Anthony is easy to spot in the near-deserted city, wearing a Scottish kilt, indicative of the diversity of the varied Bahai cultures — spanning 75 nationalities and several million followers — so says the movement. “It’s hard to put it into words, it is the most holy place in the world for us,” says Gillian. “To be able to visit is the biggest blessing. We have to do it at least once in our life.” […] Gillian says all the pilgrims prayed together on Monday. Followers believe in the coming unification of humanity even if the world must first go through difficult times, such as those that started with the conflict between Israel and Hezbollah on July 12. “The world is getting darker and darker, but we have a more long-term vision,” says French architect Daniel Caillaud who has lived in Haifa since 1988. During a visit to the pristine gardens “whose beauty shows the optimism of the Bahais” according to Indian follower Elisa Rasiwala, 53, the air raid siren shrieks once more, heralding the next rocket attack on Haifa. People on both sides of the Israeli-Lebanese border remained on high alert Sunday as Hezbollah and Israeli forces exchanged rocket fire and heavy artillery for a fifth day. Hezbollah, a Lebanese-based militant organization sponsored by Iran and Syria, fired rockets that fell on the northern Israeli port of Haifa, killing at least eight people and wounding 20 others, some of them seriously. Israel police said the dead were part of a repair crew at a rail station that took a direct hit. One rocket tore a huge hole in the roof of the station. Others landed in the street nearby, where people ran from their cars to escape, according to Israel Radio. 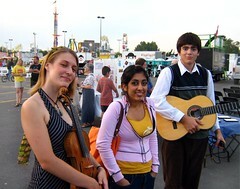 Update (Aug. 20, 2006): Read the latest news about Haifa in my August 20th blog post. Update: The Globe and Mail ran a new story about life in Haifa that mentions the Baha’i Shrine and Gardens.